NEW! Completely renovated, charmingly furnished!Our beautifully furnished apartment has three centrally-accessible bedrooms with double beds(180x200) livingroom with pull-out sofa.In modern, fully equipped kitchen you can enjoy prepared meals:dishwasher, coffee maker, stove, microwave, refrigerator, dishes, etc. When you come back in the evening from the beach,(200m) away you can unwind and enjoy really good in front of the large flat screen TV with satellite, WiFi and air conditioning. You may also smoke, but please only on the balcony, from where you can enjoy the view of the sea. Shopping and procurement of goods for daily use are nearby: supermarket, post office, pharmacy, small market with daily fresh fruits & vegetables. Despite everything, apartment is very quiet and surrounded with a lot of tree. Parking you get free in front of the house. I'm looking forward glad to welcome you in Rijeka. We had a lovely stay at the apartment and really enjoyed our time in Rijeka. We went to both the grill and fish restaurant that were recommended and both were really nice. 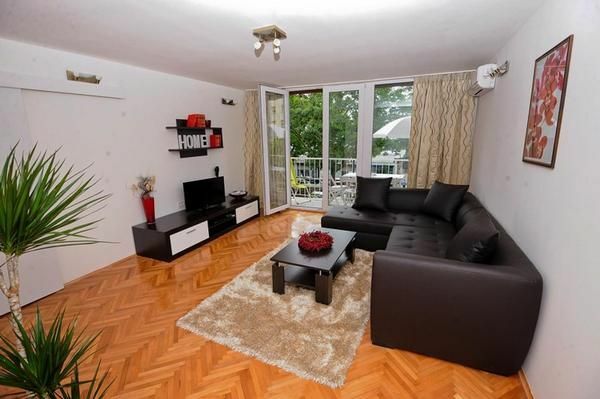 I would recommend this apartment if you ever go to Rijeka.